Hot Deals: Richer Sounds offers big discounts on top-brand Blu-ray players | What Hi-Fi? The superb Denon DVD-2500BT transport, officially £900, is available for £600, or you can have a Denon DVD-1800BD player for £500. Alternatively, Pioneer's five-star BDP-51FD is all yours for £320 (normally £350) and the Award-winning Panasonic DMP-BD35 is just under £190. If you'd prefer a Sony Blu-ray player, how about the five-star BDP-S350 for £160, or the BDP-S550 for £220? 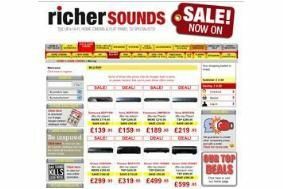 Check out these and other hot deals on the Richer Sounds website.